That Dapper Chap shows us how to make those outdated wide ties slim and cool! We suggest reading all the instructions before beginning. And don’t forget to take a picture of your tie before you get to work, so you can show us the before and after pictures on Instagram! Why Slim Down Your Fat Tie? We all know that it’s the way you finish your look, with accessories, that truly makes you stand out from the rest. Those essential details really give you the chance to show your personality through your attire. Ties are a great way to distance yourself from the crowd. Personally, I avoid any man who sports a Disney or Loony Tunes character on his tie, or wears one with annoying slogans, like “Horny Devil” or “Best Dad”. A well coordinated or contrasting tie makes me take a man more seriously. You don’t have to spend a fortune on ties. Thrift shops are full of them, many with great bold patterns, retro prints, and paisleys. But, as great as they look, they’re usually a bit wide, right? This can make your look appear outdated, even with the coolest pattern or best-matched colour. Today I’m going to show you a step-by-step guide on how to make those fat ties slim. With an hour or so to spare, and the most basic skills and equipment, you can turn that $2 thrift shop find into a new, cool and funky accessory that nobody else will have. Maybe some Nina Simone on the iPod too, because why wouldn’t you? Take your tie, turn it over and undo the back seam using your seam ripper (Fig 1). Locate the thread holding the tie closed, gently pick it up with the point of your tool, and cut it. Be careful not to catch the fabric as this will result in plucks or holes. 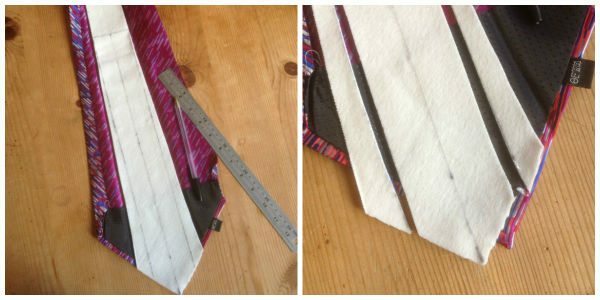 Work your way from the fat end and open up 3 quarters of the length of the tie, leaving 1 quarter intact. This will help hold things together while you work. There’s no need to make the narrow end of the tie smaller as it should already be the right size (Fig 2). Make sure you take note of how your tie loop is affixed. Some are sewn into the back seam, while others are sewn on to the finished garment. Detach the tie loop with your seam ripper and keep it to one side so you can reattach it later. Tie loops are often made from the same fabric as the tie or could be the manufacturer’s label. Either way, it’s that loopy thing on the back of the tie that you slip the skinny end through after you’ve tied the knot. When your tie is open, you’ll see a thick white fabric called interfacing. This is what gives the tie weight and structure. Some will be thin, others thicker. 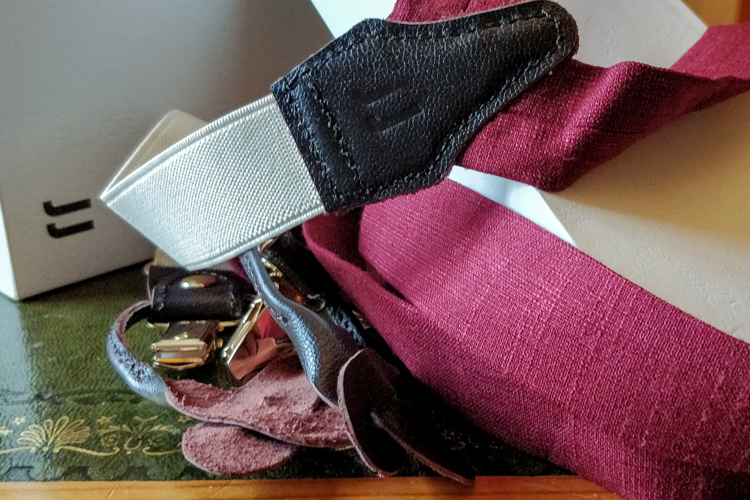 I’ve found that some ties don’t even have interfacing and simply rely on the thickness of the fabric to retain the level of structure needed for the tie to look good and hang well. Sometimes, ties that have no interfacing are too light and result in a small, tight knot when tied. I’m not a fan of this look and avoid very light-weight ties when buying from vintage stalls, stores and thrift shops. You can add an interfacing yourself but that’s a project for another time. Spread the tie open, slip the interfacing out of the pointed pocket in which it sits, and put it back in place on top (Fig 3). Now you need to find the centre of the interfacing. Measure the width of the interfacing at its very widest point (right where it changes to a point), and add a mark at its middle. Move up and repeat the process until you have 3 or 4 marks that allow you to draw a straight line down the very centre of the interfacing (Fig 4). You now need to decide on the finished width of your tie. You can go very skinny or just a bit smaller than the original. I suggest measuring the width of a tie that you like the size of and applying that. Women In Ties and Bow Ties, Right Or Wrong? Using your centre line, measure out an equal distance on each side to determine your desired overall width. Again, draw straight lines up the tie until the point at which the actual tie naturally comes to this measurement. I marked a horizontal line on my tie to highlight this in the picture (Fig 5). Now cut off the excess interfacing, saving the pieces you removed for later (Fig 6). Pop the interfacing back into its pointy pocket and lay the tie nice and flat and even (Fig 7). Now you need to trim the main fabric of the tie back. 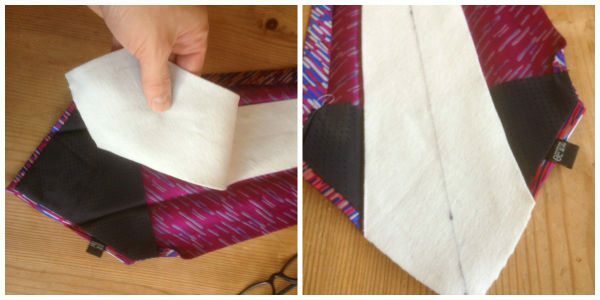 Use the excess pieces of interfacing that you just cut off as a guide of how much you need to take off, and to what length. Cut and discard all of the extra pieces (fig 8). We now need to create some hems to prevent our raw edges from fraying and being unsightly. Fold over 5-10mm of your freshly-cut edges, taking care to consider the original hem on the third of the tie that we didn’t cut. This can take a bit of fiddling, but make sure you iron your new hem edges and that your tie has a nice straight hem edged on each side. I would suggest using a steam iron or a damp cloth to avoid burning, especially with silk or polyester ties. It doesn’t matter if there’s a little bump or wrinkle where your new work meets the original tie, as this will be covered, but it helps to consider this for the overall finish and avoid it where possible (Fig 9). Next fold the fabric of the tie over the top of the interfacing, folding it tightly against its edge. Iron this for a crisp edge (Fig 10). Make sure that you fold the correct side over first, taking into account how the skinny end, that we never unstitched, is folded. Now repeat with the other side, overlapping it on top of the side you just folded and ironed (Fig 11). Iron under a damp cloth again for a nice crisp edge. When you are satisfied with your finish, pin the new skinny tie down your newly-created seam. DO NOT pin right through the entire tie, simply catch the top 2 layers of the new edges that you’ve created (Fig 12). Pinning right through the tie will distort its shape. We now need to sew the tie closed using a basic ladder stitch (Fig 13, 14 & 15). Be as neat as possible and take your time here. Your stitches don’t need to be small but they do need to adequately hold the 2 edges in place. Using a single thread, thread your needle and knot the other end to prevent it from pulling through and unravelling. I usually start at the skinny end that we left stitched. Secure your thread here with a couple of small stitches, making sure that you start under the fabric so that the thread’s knot is lost inside the finished tie. Only catch the top layer of fabric with each insertion of the needle. Go in with the needle and come out half an inch or so away. Catch the other edge, putting the needle in opposite to where it came out on the other side. Repeat down the entire length of the tie until you reach the end. If your tie had a sewn-in tie loop, pop this in about a third of the way up and catch this in as you sew (Fig 16). If it had the type that is affixed on the outside and not sewn in, sew the tie closed and reattach it with a few stitches when finished (Fig 17). Step 7 – Check Yourself Out In The Mirror! Et voila! You have your very own up-cycled and unique tie! Wear it with pride. Looking for more great projects? Thanks! I’ve been seeing for 45 years but have never narrowed a tie. Your instructions and photos are perfectly clear. I appreciate your time in putting this together. Great instructions! Thank you so much for posting this, as my husband just realized this past weekend that all of his ties are too wide, but are too expensive to throw away. You’ve saved us a lot of money, and he will be so much more fashionable. Many thanks! Much appreciated! Glad to hear that the guide was helpful. Any idea how much time is involved? Depends on your skill set. If you’re handy with the required tools, it could take minutes. If not, you might need a few hours.